If a car just hit me ever so carefully and I break my leg just a little bit, or if I accidentally just fall and break my arm maybe then I don’t have to do my simulator check? Thoughts that go around in my head every time I am scheduled for my simulator check. Every six month we have to do a simulator check where they put us in situations that we would normally not be in *knock on wood. Single engine approaches such as circling that we don’t fly on every day’s basis, nonnormal situations etc. I can’t go too much into details as it’s all confidential, but you get the picture, it’s a stressful situation where we are checked on every single little move that we do or say. Don’t get me wrong, I wouldn’t want to do the sim checks, I know just how important they are for safe operation, but that doesn’t make them any less stressful. I let the instructor know that I was nervous and he assured that there was absolutely nothing to be nervous about, that most of us do get a bit nervous. I don’t know why I’m like that, I’m not a nervous kind of person. 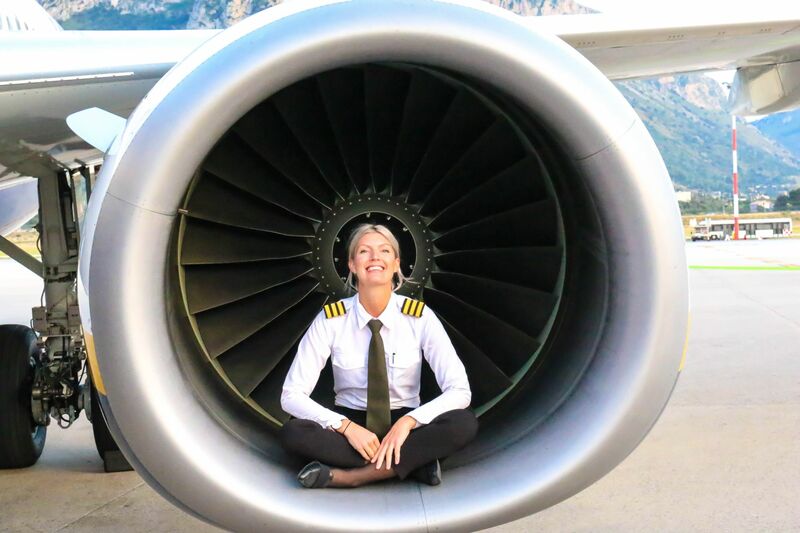 I like to believe that I’m someone who maintains my calm throughout most situations, but it’s something about being checked, especially when it’s something that I love as much as I love Aviation, you don’t want to get a number on how good you are at something that you love? I had the same kind of nervousness when I took my ATPL exams. If I remember correctly it’s 14 subjects that you need to pass with an at least 75% pass mark. No matter how 100% sure I was that I must have at least a 90% pass I would still sit until last minute before submitting for my result, I didn’t want to get a number, a percentage, ‘you are 95% good at Principle of Flights’ or whatever subject it was, Meteorology and Principle of Flights were my two favorite subjects! So here I was, woke up early the day of my sim even if my check wasn’t before 6 pm that day. The checks normally take around 6-7 hours, five hours scheduled in the simulator, an hour briefing and half an hour debriefing (that depends how much you have to debrief). I took the bus to our sim center and arrived there approximately half an hour before the briefing, still thinking, maybe I just slip and break my leg, oh is that a headache? Maybe I’m sick? I shouldn’t be in the simulator if I’m sick, I can get the Captain and the instructor sick, for sure I have to go home, that’s the right thing to do, right? You know the classic picture when you have an evil little devil on one side of your shoulders and an angel on the other, the devil telling you to do the bad thing and the angel trying to stop you from doing it. That is pretty much how I feel right now, the little shoulder-devil telling me to go home but at the same time the wise angel letting me know that there’s no way to get out of it, if I don’t do it today I’ll have to do it sooner or later anyway, it comes with being a pilot and there is no way out of it! As we sat in the briefing room going through what we would do on the check it started to feel a tiny bit better. I was paired together with a really nice and experienced Captain and our instructor seemed nice and relaxed, not relaxed in that sense that he wouldn’t care if we did anything wrong, but more relaxed in a way that he made me feel relaxed also. Because isn’t that funny how many stupid mistakes we do because of nerves being in our way? Once in the simulator time ‘flew’ passed and back in the briefing room, it felt like we were just there, even if five hours had passed. You have no idea the feeling that I have today, after two days of intense training and weeks of studying beforehand, you know when you have a cold or the flu and you can’t remember what it felt like before you were sick, that’s the feeling I have when I see that I’m scheduled for my 6 months check and now afterward it’s like the whole world opened up and I don’t know what to do with all my spare time, so as I write this I’m sitting on the train on my way to London for some well-deserved shopping. That you for reading, if you have any question let me know below in the comments or on my Instagram @pilotmaria. Forgive any typos, wrong spellings or grammar mistakes, English is not my first language and I’m writing on the go. Thank you for sharing, Maria! No where near your skills or caliber, but as a private pilot SEL, I always dreaded the “unusual attitudes” under the hood, and I had a particularly sadistic instructor. Always walked away in one piece and feeling better about myself for having performed the way I was supposed to, but my shirt was dripping wet when I popped out of that C-152. So………..your comments above I TOTALLY sympathize with! Thank you again for sharing your life with us, I hope this finds you in good health and with wonderful adventures laying ahead of you! Aww that’s awful with a sadistic instructor 🙈 know that not all are like that and remember that it’s your training that you’re paying for, you have the right to ask for a different instructor! I enjoy reading your blogs. I’m surprised you were so nervous. However, I guess it is how you turn your nervous feelings into correct and safe actions during your test. Lets be honest during your 5Hr “flight” you and your Captain will be subjected to a whole series of incidents that the two of you – working as a team will have to mitigate. Those mitigation actions would have to be seen to be completed in accordance with your company operating instructions and the Pilots Notes whilst speaking clearly as a check against your actions and activities that the CVR can pick up on. The amount of mitigation required, during your test, may well represent a fair slice of your entire pilots career – as far as issues are concerned. No body is going to be injured if the two of you “get it wrong” in the simulator. Clearly, it is important that you don’t make mistakes on the flight deck during a flight. Your actions in a true emergency would often be “automated” in the their completion and part of the memory retention required is refreshed, in a safe environment, during your mandated six monthly check. Safe take offs and landings….